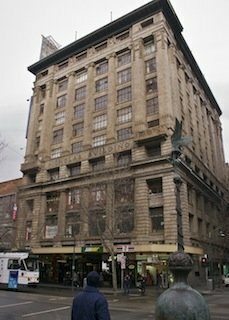 The Nicholas Building is a landmark building in Swanston Street on the corner of Flinders Lane. It is one of the uniquely Melbourne places: a vibrant and creative hub housing hundreds of studio artists, makers, designers and creative Melbourne businesses. It was built in 1926 by Architect Harry Norris - in a Chicago style, with massive stylised Greek columns - and was the grandest commercial palazzo in the city, housing small offices from designers to accountants, and later even Coles. It got its name from merchant and philanthropist Alfred Nicholas. Its art deco tiled interiors are original  a unique 1920s architectural experience! You enter it under the vaulted leadlight ceilings of the Cathedral Arcade, where you can still see the original mailbox and glass chute that carried the mail from above. Stepping into the rickety looking lift and having the sliding gate close behind you can be a bit creepy - youre not quite sure whether you will make it to the right one of 11 floors. But other than having gone up and down a number of stories a few times too many before opening its doors, it has delivered us thus far to the right destination youll get used to it. There are always the stairs anyway. One of them still has a lift lady (or man) operator  her lift is lined with images, notes and pictures, and is part of the experience. Each of the upper levels is centred around a central light well, the stairs and lifts. A ring of smaller corridor studios, a long encircling corridor, and outer ring of more spacious studios surrounds this. 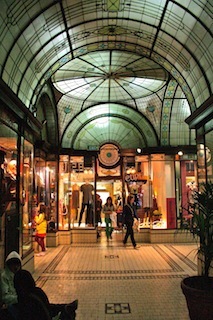 They are occupied by resident printmakers, painters, jewellers, sculptors, writers, book-makers, book artists, milliners, galleries, healers, fashion designers and boutiques and some truly unique Melbourne businesses. Every winter the Nicholas Building artists and businesses have a few twilight evening of Open Studios . This is where the artists, makers and designers open their studio doors.